Handmade in the USA, beautiful abalone and silver browband. Ample 1.5" bridle loops fit regular bridles as well as padded crown double bridles! Black Flat Browband With White Padding 15.5"
Black browband with white padding. No channel. Use by itself or add beads to it to make your own design. Bridle loops are 1" wide. Total width is 1" wide or 25mm. 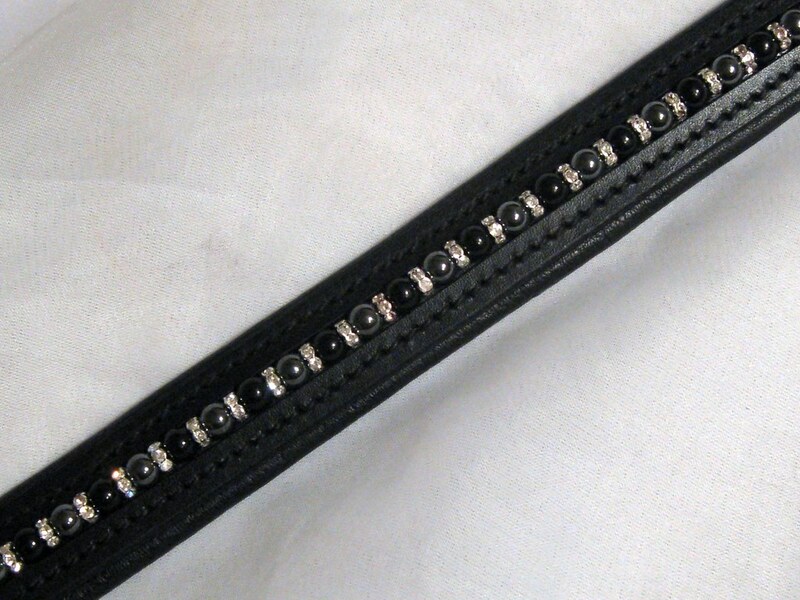 Gorgeous sparkling browband available in all sizes, brown or black leather. Each browband is handmade to order in the USA. Real agate gemstone and Swarovski crystals. Stunning! Silver Butterflies Fly Away Into The Blue Crystal And Light Blue Pearl Beading On This Lovely Leather Browband. Gorgeous Delfina dutch drop browband with Swarovski crystals and an elegant crystal wire. Bridle loops are a generous 1.5" to fit padded crown and double bridles. Very popular dutch drop shape seen on top horses! Black. Two slender white rinestone strands are delicately hand stitched into these browbands.